On Tuesday, we launched a revolutionary new software product for small businesses and changed our company name from Infusionsoft to Keap. I’m so proud of our company’s transformation and the role of our marketing team during this rebranding, in particular, the leaders of this rebellion: our Director of Creative and Content, Jake Johnson, who led the development of the name, brand and commercial, and our Director of Product Marketing, Chris Leet, who led the overall relaunch across the company. My hat’s off to them. After 17 years in business as a pioneer and leader of CRM software for small businesses, yesterday was arguably the biggest day in our company's history. In addition to Jake’s post about the creative inspiration and process, and co-founder Scott Martineau’s background on the decision to undergo such a major change, I wanted to give the backstory for the name change and the development of the commercial. You may think a name change isn’t such a big deal. If so, ask yourself: When was the last time someone you know changed their name? Like your own name, a business’s name is so much more than mere words. Names help define us. A company name tells the outside world what’s inside. On Keap’s inside, we hope to serve millions of small businesses, not just tens of thousands. With this name change, we’re telling the world we are blossoming into the company we always knew we were and are closer to becoming. It’s a company that knows the struggles of small businesses and helps them to overcome. As in…Keep Going.Keep Serving (your customers).Keep Growing. Once we had a name we needed to make hay. For the unveiling to the world, we cast about for how to creatively express these struggles and successes. We knew, as former entrepreneurs ourselves, that most major companies serving small businesses only show the positives of owning a small business–the sunny side, if you will–with the successfully closed deals, a growing company bursting at the seams with happy customers, and proud owners like moms and pops with arms folded in front of their glistening shops. Such moments are true, but rarer and ultimately disingenuous to the tough moments and challenges owners mostly experience as they repeatedly pull themselves up and dust themselves off to get through their day. So we wanted to show the truth. We thought that if we let small business owners know we know about those dark nights of their soul, they’d believe that we know enough to allow us the privilege to be the software that handles running their daily business. Today, with our new company name, rebranding, and new product, Keap is declaring we will help quiet those dark voices. Today, we help quiet the doubters. 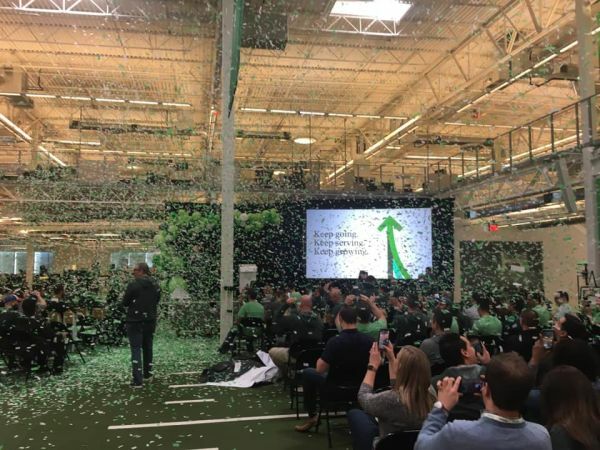 Celebrating the launch of Keap at our headquarters in Chandler, AZ with plenty of “Keap green” confetti.